Considered as a beautiful pearl of Hoi An in the central coast province of Quang Nam, the Cham Island has many interesting things to explore. Situated about 15 km from Cua Dai beach, Cham Island comprises eight islets. It is endowed by nature with terrific advantages: nice weather all year round, unspoiled and beautiful beaches and great landscape. Visitors can discover and enjoy many things on the island. In 2009, the island was recognized as a world biosphere reserve by UNESCO. It has more than 1,500 ha of natural forest and more than 6,700 ha of water surface, and is home to a critical ecosystem that includes coral reefs, seaweed and sea grass beds. The area is also rich in marine resources, including many species of ecological and economic importance. Some other tourists said Cham Island diving was worth of 5/5 points. Besides a rich ecosystem, the Cham Island Marine Protected Area’s ancient monuments absolutely captivate tourists. The excavated ruins are proof of the former cultural and trade exchanges between Cham Island and countries in the region. The island was once a transshipment point of international merchant ships on the maritime silk road found in the 13th century. Famous vestiges such as Hai Tang Pagoda, Cham Well in Cam village, Temple of the Founder of the Edible Birds Nest Industry, Mausoleum of the Tutelary God reflect the prosperity of the ancient Cham and Vietnamese people thousands of years ago. For those who like tranquility, unspoiled countryside and relaxation, the island is an appropriate destination. 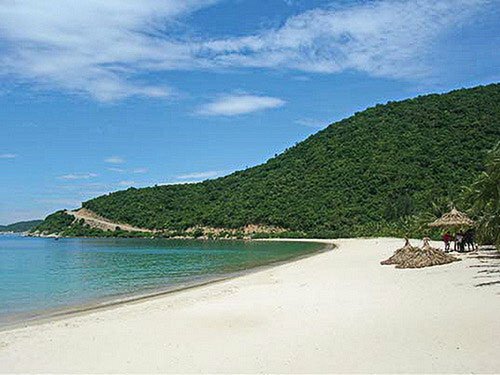 Its beaches which are almost untouched by humans are as beautiful as those on Phu Quoc Island off Kien Giang Province in the country’s south. Visitors can enjoy the fresh air and warm sunshine. However, the island is less known due to insufficient promotion and inconvenient transportation. Visitors can also stay overnight at a fisherman’s house. The islanders are friendly and honest. Visitors will enjoy savoring rustic but delicious dishes made with wild vegetables, fish, squid and pickles and listen to the home owner’s fishing trip stories or legends about the island. Those who want to go to Cham Island to simply enjoy fresh seafood could take a squid catching or fishing tour. Travel agents and fishermen will take them to a fishing ground. Caught fish and squid will be served at a restaurant or right on board.